One of my favorite comics as a kid was “Sgt, Fury And His Howling Commandos” which was a World War II series that was at the opposite end of DC Comic’s “Sgt. Rock of Easy Company” series. Whereas Sgt. Rock was a more or less realistic portrayal of that war, Sgt. Fury was lighthearted and played for flat-out action. Sgt. Fury had a colorful collection of Howling Commandos who breezed through the war without worrying much about getting killed. It’s safe to say that “Sgt. Fury And His Howling Commandos” had about as much to do with a realistic depiction of World War II as Indiana Jones has to do with a realistic depiction of archeology. But the thing that really caught my attention about the character was when Nick Fury was made the star of a second comic book that depicted his adventures 20 years after World War II had ended. Nick was a little older, a littler grayer, a little more cynical and had lost an eye. He was invited to be The Public Director of a worldwide counter-intelligence/paramilitary strike force called The Supreme Headquarters International Espionage Law enforcement Division, code named S.H.I.E.L.D. The series really took off when it was written and drawn by Jim Steranko who turned the book into a worthy competitor of the other super spies such as James Bond, Derek Flint and Napoleon Solo who were part of the spy craze of the 60’s that infested books, movies and television then. The Nick Fury comic book was virtually film on paper as Steranko revolutionized the comic book genre with his brilliantly innovative storytelling techniques, including what I think is probably the only four-page foldout ever done, a wild action scene depicting Fury and the forces of S.H.I.E.L.D. battling The Yellow Claw and his minions. Back in the 60’s you actually had to buy two comic books (which cost 12 cents then!) to get the whole effect of the layout but thankfully there’s a TPB collection of Steranko’s Nick Fury run so you can savor that sequence the way it was meant to. I’m on my second copy of the TPB as Steranko’s Nick Fury was a big influence when I began writing my Dillon character and I read my first copy so many times that pages started falling out. Jim Steranko was obviously a big influence on the made-for-TV movie, NICK FURY, AGENT OF S.H.I.E.L.D. because the movie is a wonderfully faithful adaptation that is true to the spirit of the Steranko run. I get a lot of disbelieving looks from friends of mine when I say that I like NICK FURY, AGENT OF S.H.I.E.L.D. and actually prefer watching it over the bigger budget theatrical Marvel features such as “Daredevil” and “Elektra” mainly because when I watch NICK FURY, AGENT OF S.H.I.E.L.D. I get the impression that the cast and crew actually took the time to read the comic books. Colonel Nick Fury (David Hasselhoff) is in solitary self-imposed exile in the Yukon, having left S.H.I.E.L.D. five years ago and just wants to be left alone. But since his old enemy, the terrorist organization HYDRA is back in action that’s not about to happen. This new incarnation of HYDRA is being led by Andrea Von Strucker (Sandra Hess) and her brother Werner (Scott Heindl) who have stolen the cryogenically frozen body of their father, Baron Wolfgang Von Strucker in order to extract a sample of The Death’s Head Virus from his DNA. Nick’s best friend Clay Quartermain (Adrian Hughes) was killed by Andrea in a particularly gruesome way trying to prevent Strucker’s body from being stolen and Nick is coerced to rejoin S.H.I.E.L.D. by the Contessa Valentina de Allegro Fontaine (Lisa Rinna) and Alexander Goodwin Pierce (Neil Roberts) who quickly ushers Nick to The Helicarrier, which is virtually a flying aircraft carrier where Nick is reunited with his old friends, S.H.I.E.L.D. Deputy Directors Timothy Aloysius ‘Dum-Dum” Dugan (Gary Chalk) and Gabriel Jones (Ron Canada) and resumes his rivalry with General Director Jack Pincer (Tom McBeath) who had a hand in forcing Nick out five years ago. S.H.I.E.L.D. quickly puts together the nefarious plans of Andrea Von Strucker who now calls herself Madame Viper: she plans to fire four missiles at Manhattan containing The Death’s Head Virus which Gabriel Jones claims is so lethal it “makes Ebola look like a case of the sniffles” and the only one who can give them an idea of how to cure the virus is the former Nazi scientist Arnim Zola, the man who helped Strucker develop The Death’s Head Virus. It turns out that HYDRA is using Nick to lead them to Zola and Nick himself is infected with a poison that will kill him in 48 hours which coincidentally is how long he’s got to stop HYDRA from wiping out Manhattan. It’s a race against time to not only find the missiles containing The Death’s Head Virus but also to find a cure to save Nick’s life. Here’s where I alienate most of my comic book reading buddies and I’m sorry but what the hell: I like NICK FURY, AGENT OF S.H.I.E.L.D. a whole lot. If anybody had told me prior to my seeing the movie that David Hasselhoff could have pulled it off I’d have laughed myself into a hernia (my dream casting choice for Nick Fury is the young Jack Palance) but damn if Hasselhoff doesn’t look exactly like the Jim Steranko version of the character. And the best thing I like about Hasselhoff is that he obviously did his homework. There are several lines he throws off in the movie that I would swear come right from the comic book. He swaggers through the movie with Fury’s trademark cigar stuck in his mouth and even though there’s no mention made of Fury’s World War II career, Hasselhoff plays him with traditional 1940’s values of country, honor and sense of duty in a modern world and it works. Even his friends refer Nick to a ‘dinosaur’ but everybody acknowledges his love of country and sense of honor. The rest of the cast is equally good. Lisa Rinna has two of the most beautiful eyes this side of Meg Foster and she’s got great chemistry with Hasselhoff. During the scenes with Valentina searching for the missiles in New York, take a close look at her second in command. Yep, that’s Roger Cross who played Curtis Manning on ‘24’. They never give his character a name so I’d like to think that maybe this is Curtis Manning before he transferred to CTU. Ron Canada as Gabriel Jones has some nice scenes with Hasselhoff that go a long way to making you believe these guys are old friends. But Sandra Hess is the acting standout here as Madame Viper. You may think she’s over the top and maybe she is but so what? She realizes that they’re making a 90’s version of a 60’s spy movie and she acts accordingly. Every time she’s on screen it’s a lot of fun to watch her chew up the scenery. And while the movie suffers from its lack of budget it makes up for it in a lot of ways. The interiors of The S.H.I.E.L.D. Helicarrier are as functional as those of an aircraft carrier that for me added a note of realism. HYDRA operates out of abandoned warehouses. And there’s a whole wealth of background detail that for me added so much to the movie such as a shot where we see Nick’s ID and see that his middle name is Joseph, which again is right from the comic book. There’s a whole bunch of characters from the comic books such as the wonderfully named Gail Runciter, the Chief ESPer agent Kate Neville (an elite corps of S.H.I.E.L.D. agents with telepathic abilities) who get in on the action and have considerable screen time as well as the Life Model Decoys: androids developed by S.H.I.E.L.D. scientists that are totally indistinguishable from the people they are modeled on. So should you see NICK FURY, AGENT OF S.H.I.E.L.D? I think that really depends on how you feel about Made For TV movies and David Hasselhoff more than anything else. 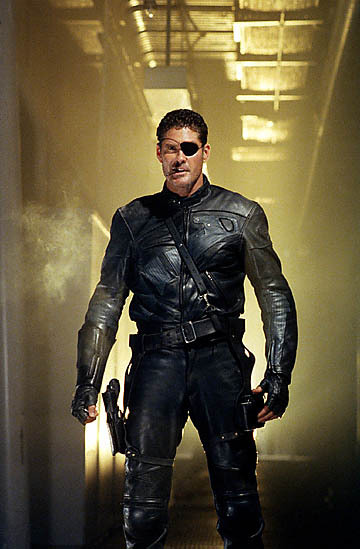 I know people who have told me they won’t watch David Hasselhoff playing Nick Fury if I paid them and that’s okay. I had the same opinion once. NICK FURY, AGENT OF S.H.I.E.L.D. is made with integrity and it’s made with respect for the source material, which I appreciate a whole lot. It’s not pretentious and it doesn’t pretend it’s a ‘serious motion picture’. It’s an adaptation of a comic book character and that’s it. And on that basis it succeeds very well. And if you’ve been reading my movie reviews for the past couple of years and trust my judgment then let me tell you this: NICK FURY, AGENT OF S.H.I.E.L.D. is nowhere near as bad as your friends have been telling you it is. Do you know where I could get a dvd copy of the movie,I’ve tried all the usual outlets but to no avail. I would love to see it again,how could anyone not love the hoff as the first howling commando? I myself burned the movie onto a blank DVD when I DVRed it off The Fox Movie Channel some years ago. Somebody at FMC must like it a lot as they air it quite a bit. A few friends of mine have told me they’ve bought official DVDs from Amazon.com. As you might imagine, once the theatrical Marvel movies started up, it didn’t take long for this one to make it onto DVD. I actually quite liked the film. Of all the TV adaptations of Marvel characters, it felt like the one that actually tried to stay as true to the original as possible. And with all respect to Sam Jackson, Hoff may be the perfect Fury. The man knows how to chew a cigar. As much as I love Hasselhoff as Fury (and saying I love Hasselhoff in anything is a phrase I never thought possible for me to utter), I just can’t find Hess anything other than one of the worst actresses in the history of acting. I get what you’re saying about her trying to play a 60s style spy villain, but even as that, she hams it up to incredible extremes. And I’m not even sure if that was her intention, when I’ve seen her in other roles that are nowhere close to being like that, yet she’s still every bit as terrible (Mortal Kombat: Annihilation instantly comes to mind). This is the kind of movie you order a pizza and watch on a Sunday afternoon. I love the cheesiness of it. Derrick’s right, this movie is no where NEAR as bad as you’ve heard.